CALM’s “Whatever It Takes” (WIT) team provides intensive therapeutic interventions to children and families across all of Santa Barbara County. WIT clients have the highest level of need for mental health interventions because of their histories of abuse, trauma and neglect, severe emotional disturbance or mental illness. Many of these clients lack the emotional or family resources to attend in-office therapy. The WIT team therefore meets with clients and families in their homes or in the community. 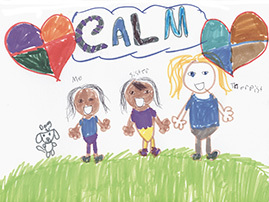 CALM therapists support and advocate for them as needed in their schools, with probation, Child Welfare Services and with other community systems in which they are involved. All WIT programs are served by referrals from the Department of Behavioral Wellness or the Department of Social Services. WIT Programs are provided throughout the County.